It’s a good thing I don’t have any kids, or I would have backed them all to the wall Monday night after I hung up the phone and paddled each one of them soundly. 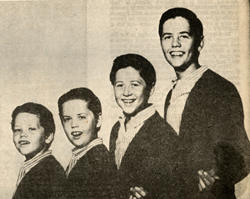 California – the Osmond Brothers, who will be in Omaha in August for Ak-Sar-Ben members. If you haven’t shelled out your 10 bucks yet for Ak-Sar-Ben membership, you have until Wednesday to take advantage of the colossal entertainment package for 1968. When I reached the Osmond family, brother Wayne was first on the line, ticking off the vital statistics for me. There are now eight Osmond Brothers and a sister, eight year old Marie, he explained, and Omaha as is expected got the five youngest brothers – Wayne 16, Merrill 14, Jay 12, Don, going on 10 and Jimmy, four. The oldest boys Virl, 23 and Tom, 21 now are doing mission work for the Church of Jesus Christ of Latter-day Saints (Mormon), and Alan 18, will leave the act in June to join them. The evolution of the talented kids dates back more than 10 years, explained Wayne, when the family lived in Ogden, Utah.